We can estimate the speed of the ping pong ball from yesterday’s demo with the help of some background information, some guesstimates, some assumptions, and a little physics. The ball has a mass of 2.7g, assuming a full vacuum of 101,325 Pascals, and cross-sectional area of the ball of 1.26×10-3 m2. The result is approximately 127.6 N of force pushing the ball inside the 10-ft long tube. Draw a free body diagram of the ball in the tube, and estimate its acceleration. Then sketch the beginning and ending conditions of the ball, including all variables and find its exit speed in mph (pay close attention to ALL units). o you think the ping pong ball was actually going this fast? Why or why not? 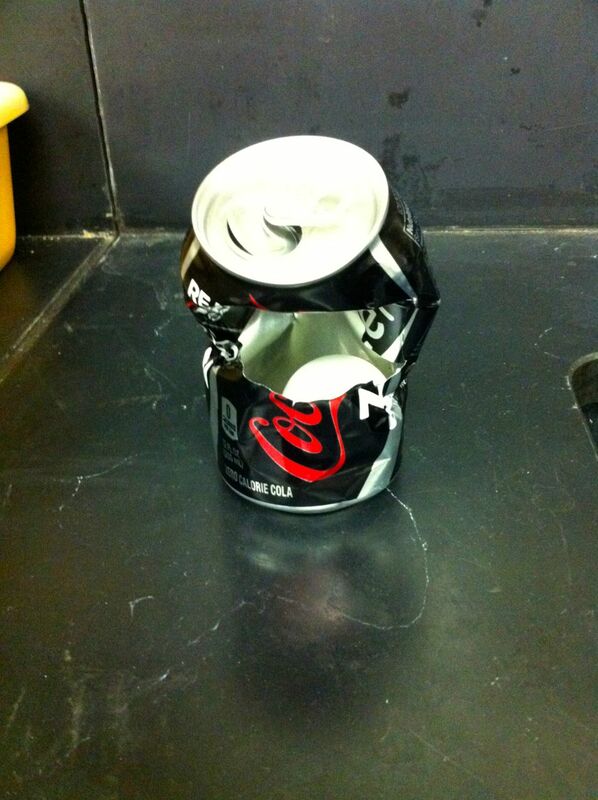 Here’s what it did to my soda can. … Most importantly I’m not afraid. I’m not afraid to ask questions; I’m not afraid to call anyone out; I’m not afraid of what people think of me; I’m not afraid to look stupid; I’m not afraid to learn new things; I’m not afraid to take risks; I’m not afraid to fail; I’m not afraid to throw it all out and start again; I’m not afraid to work hard. I’m not afraid of change. I missed last Friday. I went to the crosstown football game against our sister school but forgot to take a picture. Today, we started the unbalanced forces particle model in Honors Physics. Our paradigm lab is the modified Atwood machine. Since this is the first lab with multiple independent variables and given the complexity of the how to keep the system mass constant while changing the net force, we spent most of class discussing and planning the lab. 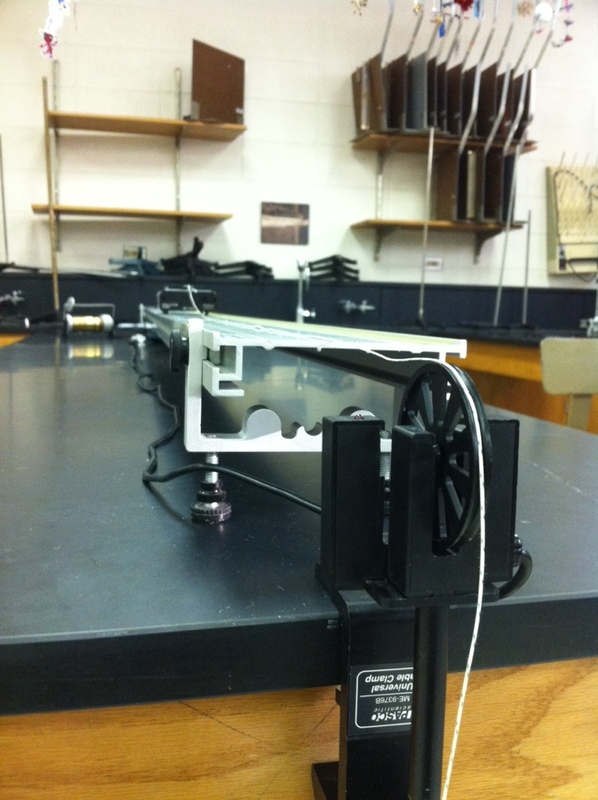 This year, we tried a new lab practicum for the constant-acceleration particle model unit. I don’t think we came up with on our own, but I don’t remember where I saw it. Students are presented with a constant-velocity buggy, a ramp, and a marble. 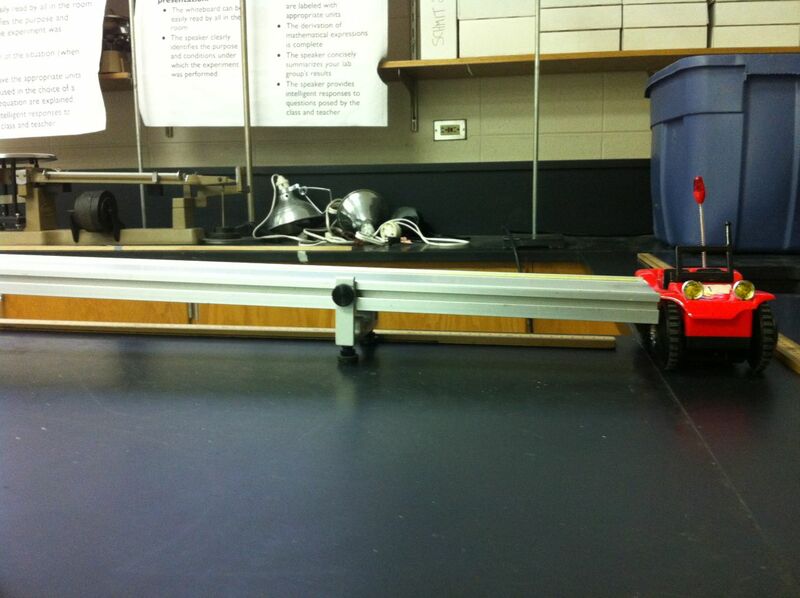 They have to mathematically and graphically model the motion of the buggy and marble as it rolls down the ramp. After they have created their models, I provide them with a displacement for the buggy perpendicular to the end of the ramp. They then calculate from where to release the marble such that it rolls into the seat of the buggy. Based on my observations of my class today as they worked on the lab, I was very surprised when most groups missed the buggy entirely. Only after checking over their calculations after school did I realize that most groups made the same mistake. They incorrectly interpreted the slope of their linearized position vs. time squared graph as the acceleration of the marble when, in fact, the slope is one-half the acceleration of the marble. They then used this incorrect value of the acceleration to calculate the initial displacement of the marble. We now have something to discuss tomorrow. 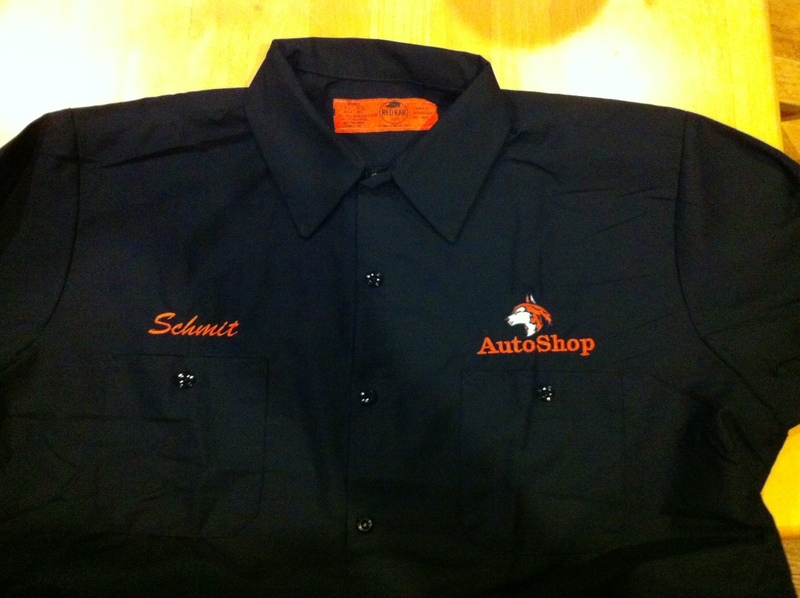 I was pleasantly surprised this afternoon when my personalized auto shop shirt was delivered. I’m looking forward to wearing it on Friday! Posted on 23 October 2013 Leave a comment on Day 47: New Shirt! Today I was home sick. I did spend some time writing recommendation letters. Almost everyone appears to be applying early action this year which makes October a very busy month. 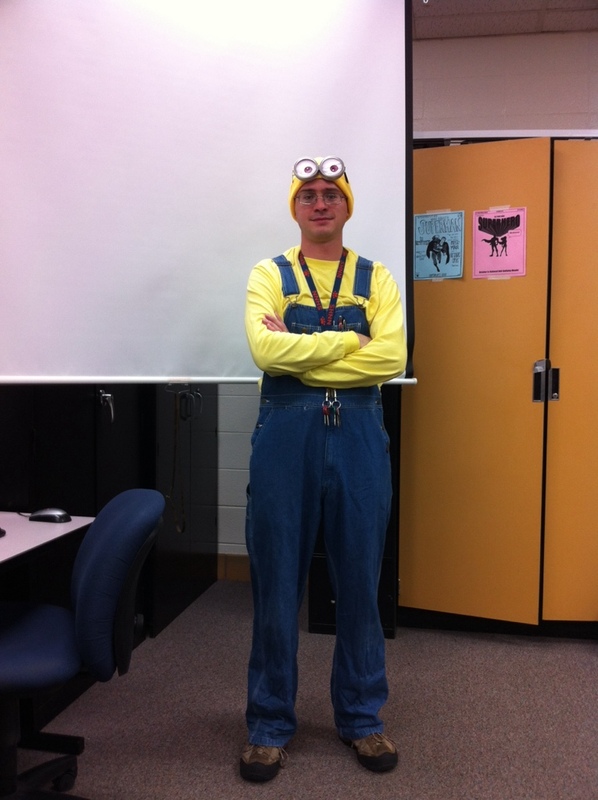 A few students asked me to advise an after school programming club. Most of these students took AP Computer Science last year and want to continue learning about computer science. Last spring, we competed in a local Java Programming competition, and this year they wanted to do more competitions. We decided to enter the Zero Robotics competition this fall. The competition is perfect for this group. It requires a combination of computer science, physics, and linear algebra. Today after school, we made our first submission for the competition. This video shows our “sphere” (i.e., the robot) avoid debris, capture the laser, and shoot the comet. (That’s all good stuff.) Our current submission ranks us 18th. We have six days to improve our algorithms! Even though it was a bit chilly, we had a great time walking outside to the stadium and dropping various objects (some of the more interesting: old globe, broken chair, shoe, empty box) off of the bleachers. Each student captured video of a drop on an iPad and then we retired back inside to use Vernier’s Video Physics and Graphical Analysis apps to graphically and mathematically model the motion of an object falling. 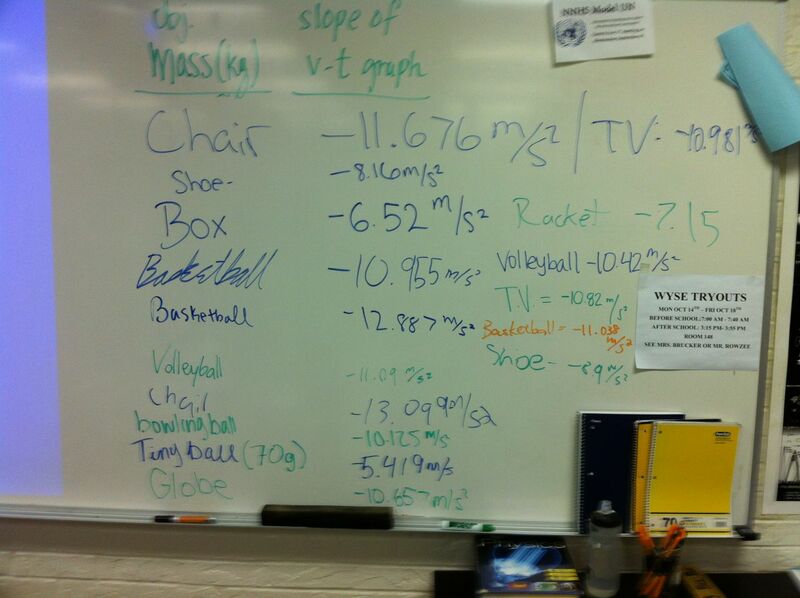 We also captured the acceleration of each object on the whiteboard to guide our closing discussion. The first statement shared was that “heavier objects have a greater acceleration.” The second statement shared refuted that idea “except for a couple objects, everything seems to have about the same acceleration.” Then the bell rang. We’ll pick this up on Monday and students may need a reminder about measurement uncertainty. AP Computer Science students spend the second half of class conducting peer code reviews. I used the peer review functionality of Canvas to assign students peer reviews. I was pleased with the discussions I overhead and the constructive comments being shared. We have an exam tomorrow, but I think we will continue peer reviews on Monday since several pairs indicated they need more time. I need to do this more often!